Britain's rail infrastructure firm wanted a venue for its AGM to reflect its heritage and future. THE BRIEF Network Rail owns and manages the British Rail network. 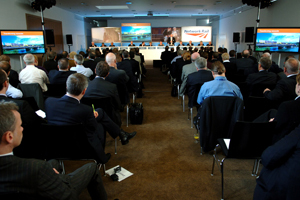 Each year the company holds an AGM attended by members of the public and UK rail industry. "We were seeking a high-profile, out-of-London location to hold what is undoubtedly one of our most significant corporate events of the year," says Network Rail head of communications Ben Hall. "We wanted a venue that could offer an eclectic mix of old and new, with first-class conferencing facilities and a touch of the old Edinburgh." CHALLENGES Finding a venue to accommodate more than 100 delegates was difficult, especially during Edinburgh's summer months when space is at a premium. Despite the wealth of modern hotels, Network Rail was conscious that this event was a reflection of its values and heritage and would be attended by some of the company's most important stakeholders. "Our members are a sophisticated bunch and we wanted the venue to reflect that," says Hall. There were also a number of additional elements including a room for the media, as well as space for vote counting of the resolutions proposed during the day. As delegates were arriving from all over the UK, it was important that the venue offered high-quality accommodation. SOLUTION Network Rail scouted a number of venues across the city, eventually opting for the Surgeons' Hall Complex. "Having a local team in Scotland to manage the AGM also meant that site visits and meetings were easily arranged and the venue's team was happy for us to visit as many times as we wanted when we were planning the technical requirements," says Hall. Choosing the Surgeons' Hall also solved the accommodation issue. The centre has an on-site hotel, Ten Hill Place, where Network Rail booked 50 of the hotel's 73 rooms, ensuring that delegates were conveniently billeted for the start of the meeting. EXECUTION Delegates arrived in Edinburgh from all over the country the night before the conference. The main meeting was held inside the Quincentenary Main Hall, which had three adjoining seminar rooms used for the showcase demonstrations, vote-counting and as a hub for the media. Even with all the technology and plasma screens, there were few technical hitches, primarily because the production team, Crown Business Communications, had conducted a full rehearsal the night before. Lunch was prepared off-site by Heritage Portfolios and taken inside the Playfair Hall. Nine resolutions were passed during the day, including the establishment of a review group to look at the company's corporate governance arrangements, and the meeting finished at 5pm. VERDICT Logistically, Hall was satisfied with Edinburgh as having an appropriate mix of heritage and modernity. "Edinburgh offered a perfect mix of railway heritage and modern conferencing facilities, as well as easy transport links from many different parts of the UK," he says. "The Surgeon Hall offers a rare mix of old and new, historic and contemporary, much like Edinburgh itself, and the conferencing team went out of their way to help us achieve the kind of top-quality event we were after."